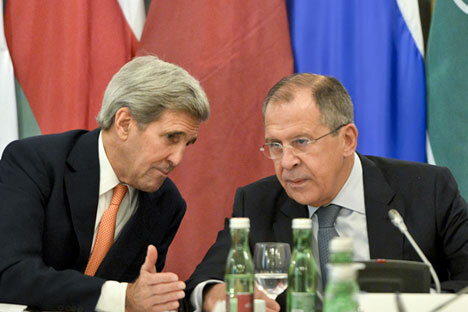 US Secretary of State John Kerry and Russian Foreign Minister Sergei Lavrov speak with each other during an international conference on Syria at the Hotel Imperial in Vienna, Austria, Oct. 30, 2015. The issue of a possible delay of the date of intra-Syrian talks from January 25 to a later date may be clarified after a meeting between Russian Foreign Minister Sergei Lavrov and U.S. Secretary of State John Kerry in Zurich on Jan. 20, Russian Special Presidential Representative for the Middle East and African Countries, Deputy Foreign Minister Mikhail Bogdanov said. "Staffan de Mistura [the UN special envoy for Syria] is working on this, but I believe that a very important meeting between Sergei Viktorovich Lavrov and John Kerry will take place tomorrow. The situation will be clarified after it," Bogdanov said in an interview with Interfax, asked whether a meeting between representatives of the Syrian opposition and the Damascus authorities may be postponed. He also said that Moscow hoped to reach mutual understanding with Washington on the list of representatives of the Syrian opposition. "Certainly, we hope for mutual understanding and a common approach to this issue. For this the ministers actually meet," Bogdanov said in comments on an opportunity to alleviate principled disagreements between Moscow and Washington on the list of representatives of the Syrian opposition. Meanwhile, the diplomat said: "I cannot predict how everything will end." The United Nations does not intend to send invitations for the talks on the Syria crisis unless there is an agreement on the line-up of participants among Syrian oppositionists, Deputy Spokesman for the UN Secretary-General Farhan Haq said previously. He told a press briefing that the UN would send invitations when the countries which initiated the process of the International Syria Support Group came to agreement about who in the opposition should be invited. Unnamed diplomatic sources in the UN do not rule out that a meeting on Syria may be delayed until a later date, Western media reported.